The voice of Gush Katif can be heard from the scattered exile of hotel rooms, dormitories, tent cities and high-rise apartment buildings all over Israel. Not a voice of divisive political mudslinging or baseless hatred, but the strong and mighty “orange” voice of faith, creativity and innovation that made the desert bloom. 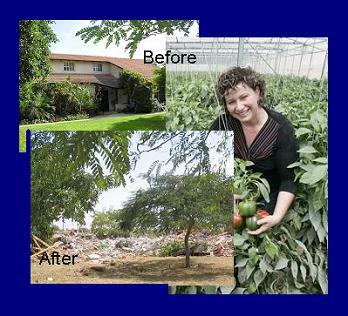 The voice of Gush Katif can be heard from the small, temporary pre- fabricated home of Laurence and Sylvain Beziz, farmers from Gadid, currently living in Nitzan. Laurence and Sylvain Beziz were born and raised in France. In 1986, they settled in Gadid, a small farming community in the heart of Gush Katif — to contribute to Israel’s future by building a strong community and raising their family imbued with values. They began with 4 dunams of greenhouses and over time, their farm blossomed. When they were expelled from their home they were working 30 dunams of their own greenhouses and leasing an additional 20. Sylvain became a renowned expert in organic farming, and his expertise is much sought-after. In addition, the family runs an organic product import business and manages an export company for organic produce. The Beziz family planted more than productive greenhouses in Gadid; they planted their family’s roots. Laurence worked in the local health clinic, in the Social Welfare Department and as manager of the local absorption center for new immigrants and, she joined the Katif Development Fund. In her fluent French, English and Hebrew, Laurence greeted visitors to the area and spread the message of these close-knit, productive farming communities. Today, the Beziz family is in the final stages of building their home in Beer Ganim, just north of Ashkelon. This is where many of the farming communities from Gush Katif have relocated. Since the expulsion, two of their children have married and Laurence and Sylvain are now grandparents.